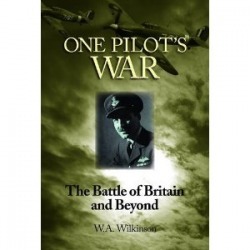 Hidden away for over a quarter of a century and never intended for publication, One Pilot's War is my grandfather, Bill Wilkinson's, secret memoir of his time as a Battle of Britain RAF fighter pilot. Found after his death, this meticulous and absorbing account gives a fascinating insight into some of the most eventful and life-changing years in recent history. One Pilot's War tells the story of a young man from a poor family who was inspired by Sir Alan Cobham's Flying Cricus to join the Royal Air Force in 1934. He rose from being an Aircraft Hand - 'the lowest of the low' - to becoming a fighter pilot and joining No 501 Squadron in 1940. He flew Hurricanes in the Battle of Britain and went on to achieve a distinguished flying career during the Second World War. It is not just the story of one man's personal battle to become an RAF fighter pilot, but also the engrossing tale of the part he played in the larger battle to defend his country during those long, dark years of war. The book is available on Amazon by clicking this link, or by emailing Sally Bryant at sallybryant@taplow1.freeserve.co.uk, rrp £8.99. You can follow news about the book on its Twitter page here, too.